Energy will lift you up! with the power of boosting your energy levels and concentration to a whole new level. Try our new line of Mig 21 products today and start living your important moments to the full. 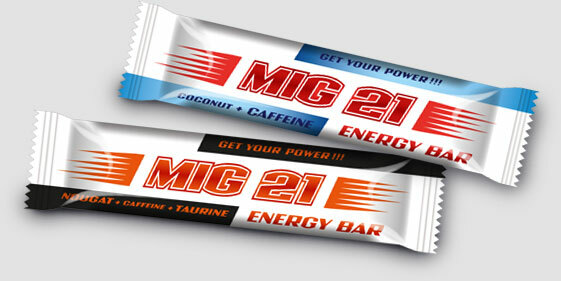 Our Mig 21 Energy bars come in delicious coconut or nougat flavor. Both contain high amounts of caffeine that will provide you with all the energy you need for your day. On top of caffeine, our nougat bar benefits from the added taurine to improve your performance and stimulate your mind. Meeting an important deadline at work or simply in need of performance boost? Mig 21 Energy is your best choice. Top quality protein is essential not only for muscle building and fat loss, it also helps you with post-workout recovery. Mig 21 Protein bars are of the highest quality with 23,5% share of protein with over 90% digestibility. All packed in with great chocolate or vanilla flavor, Mig 21 Protein is To Go protein bar for those who seek the highest quality. The best from both worlds. 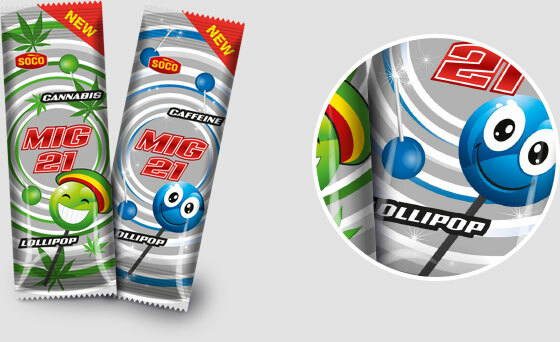 The Mig 21 Protein Caffeine bar provides you with the highest quality protein enriched with the powerful caffeine mix to keep you going. The performance boost is ideal for prolonged workouts or other physical activities. Our extraordinary chocolate and vanilla flavors will ensure the best taste there is. Energy lollipops with extraordinary flavors that you will fall in love with. Experience the most authentic cannabis and caffeine flavors you have ever tasted and enjoy them wherever you go.